Let our handyman take care of all those jobs such as changing light bulbs, putting up shelving etc – find out more about our handyman services here. There are no contracts to sign and you can be up and recycling within days. 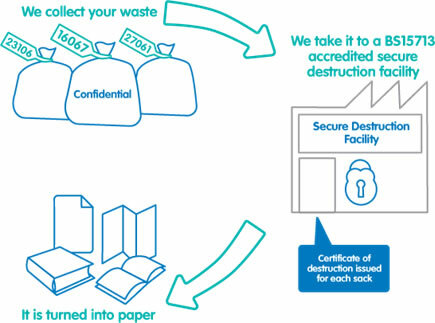 Please contact us for prices and advice on recycling your London office waste. As well as the standard recyclable items such as paper, cardboard, metal and glass CleanForce London are also able to recycle food waste, electrical items, furniture and equipment. We collect waste and London office recycling on a daily basis, which means that you don’t have to store anything on your premises. We arrange London waste and recycling collections to fit in with the timings of your cleaners in order to ensure compliance with council restrictions on kerbside waste. It would probably make things a lot easier for us if you separated out your waste. But we like to keep things simple for you when it comes to recycling. That’s why all your recyclable waste can go into our mixed recycling sacks, without having to be separated. Your mixed recycling is taken to a state of the art sorting facility in Bromley-by-Bow where it’s sorted into 14 separate material streams ready to be used in re-manufacturing. The mixed recycling goes to a MRF (Materials Recovery Facility) where 130,000 tonnes of material per year is processed for reuse. Even the plastic bags we provide you with can be recycled! The bags of material are fed through bag splitters which opens up the bags to release all the material. It’ll then go to a sorting cabin where any non-recyclables that have found their way into the bags are removed. After that, all the large pieces of cardboard and flat bits of paper are filtered out. 3D items (i.e. anything except flat paper and card!) are sucked up by a self contained fan that creates a cyclone blowing all the plastic bottles, cans and other light materials out over a belt ready for more sorting. Steel and aluminium cans are separated using two different processes to separate ferrous (steel) and non-ferrous (aluminium) metal. They’re fed through the conveyor belt where a magnetic head grabs any steel cans. Aluminium cans are pushed into their own stream by a high speed electromagnetic rotor that flings the cans into a separate pile. Remaining plastic things pass by lasers which identify what kind of plastic they are made of and sort them even further. After that, the paper and card is baled and is shipped to Europe and the Far East and ferrous metal and aluminium go to reprocessors in the UK for reuse.